Post news Report RSS	Time Trial Game Mode and Original Music for Kasplat! This week we get to present the new Time Trial game mode for our indie game, Kasplat. Get the highest score you can in 3 minutes with time bonuses awarded for epic color combos! This mode also will feature exclusive powerups. Also featured is a first glimpse at some of the sound effects for the game, though the music is still placeholder while our new audio partner, Sean Telford Audio, works on some brand new original music for the game! Welcome back to the Geekabyte Games Devlog! It's been a busy fortnight for us here at Geekabyte Games and we are super psyched to show you what's new and what's in the pipelines for our balloon busting, paint splattering, indie arcade project Kasplat! As always, make sure to follow our Facebook, Twitter and Instagram to keep up with development and subscribe to our YouTube channel for more video updates! The biggest update this time around is the brand new addition of the Time Trial game mode, and the soon to come Endless Game mode for Kasplat. Complete with a new mode selection screen, the Time Trial game mode is now functional, providing the player a new way to play the game. Given 3 minutes, hit the highest score you can before the timer runs out and earn bonus time for epic color combos. There are also exclusive powerups just for the Time Trial game mode including Freeze Time, and Double Time Bonuses powerups! Take look at the video below to get a quick glimpse at the new Time Trial game mode in action. You might have also noticed some of the brand new sound effects added to the game this fortnight. While the music you hear is still a placeholder, the SFX are a brand new addition to the game and we hope they will help make that paint splattering experience that much more satisfying. Speaking of music, we have some big news to announce; Kasplat will now be featuring dynamic, original music from local Brisbane composer Sean Telford! With the use of some clever software and skill, we will be bringing you dynamic music that will build and intensify with the game and we are super excited! The brand new Mode Select menu. On feature; the new Time Trial game mode and soon to come Zen endless game mode. 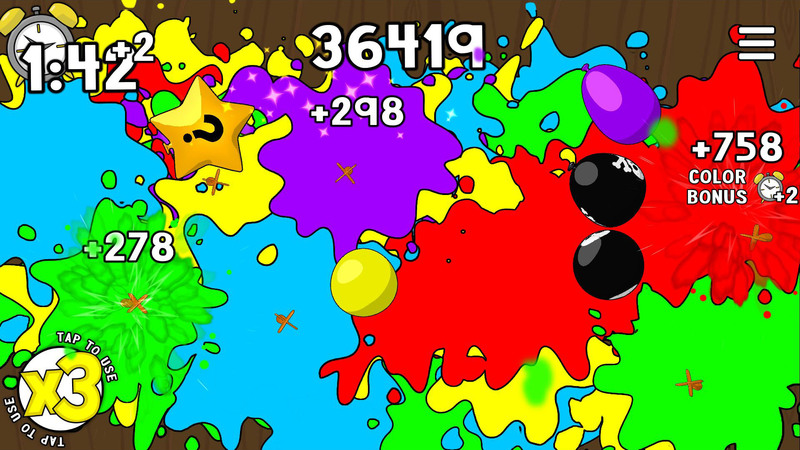 A couple of hectic screens from the new Time Trial game mode, featuring time bonuses for color combos and fast paced, splattastic balloon popping mayhem.